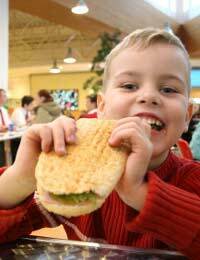 With a call from the media for fast food outlets to be banned from anywhere close to schools in the UK, it seems like the beleaguered fast food industry has a fight on its hands to keep afloat in these credit crunch times. The fast food giants have also taken a pounding in the media, with TV shows dedicated to weaning people off of their diets of junk food and criticism from popular TV personalities about the amount of junk food eaten by children. The fast food industry has had to fight back in one way and another to try and improve its image. With advertising to children now severely restricted too, getting that message across can be difficult. It doesn’t take a degree in nutrition to know that fast food contains a lot of fat – but most of it is saturated fat, and there are often high levels of trans-fats in there too. Trans fats have caused alarm in the medical profession since it was revealed that these dangerous fats, created when oils are heated and reheated, are believed to contribute towards an increase in rates of heart disease in the people who eat fast food and foods containing trans fats regularly. McDonalds and KFC were two of the chains found to be the worst trans fat offenders – but in a bid to reduce the risk they have since reduced the amount of these types of fats used in the preparation and cooking of their food. McDonalds announced in 2006 that it planned to change its cooking oil to high oleic sunflower oil which reduced the levels to a manageable 2% trans fats across Europe. KFC also announced plans to do the same as from 2007, although admitted that many of the pre-packaged and prepared foods would still contain the dangerous fats. Fast food chains have cottoned on to the fact that people now like to know what’s in their food, and that they like to think they are being healthy. So many chains have decided that they will publish their nutritional information – however scary – and also add more healthy sounding options to the menu. Pizza Hut has recently rebranded itself as a healthy eating fast food restaurant by changing the name of some of its restaurants to ‘Pasta Hut’ and offering a selection of more healthy pasta dishes to customers who associate pizza with gluttony! Whether the pasta will contain as much salt as some of the pizza meals, which have been found to contain double the adult recommended daily salt allowance, remains to be seen. Burger chains are branching out into salads and sandwiches – although beware the fast food chain salad dressing as it’s quite often the case that the salads are fine until you put a high fat dressing on them that ruins the whole effect. The same applies to the sandwiches, it’s usually the extras that all add up. Many of them are marketed as ‘healthy’ menu choices though, so be sure to ask for more information if you’re not sure.